Miami Beach is located on the coast of Miami-Dade County, comprised of a group of natural and man-made barrier islands between the Atlantic Ocean and Biscayne Bay. The community was incorporated on March 26, 1915. Miami Beach is known for its Art Deco architectural style and heritage. The history of Miami Beach began in 1870, when father and son Henry and Charles Lum purchased the uninhabited land for 25 cents an acre. The Biscayne House of Refuge was the first structure constructed in 1876 by the United States Life-Saving Service to provide food, water, and shelter for people who were shipwrecked. The City of Miami was established in 1896 with the arrival of the railroad, which developed a port by 1905. John Stiles Collins was an American Quaker farmer that moved to South Florida in an attempt to grow vegetables and coconuts on the island. The farming venture was unsuccessful but Collins went on to become a land developer. 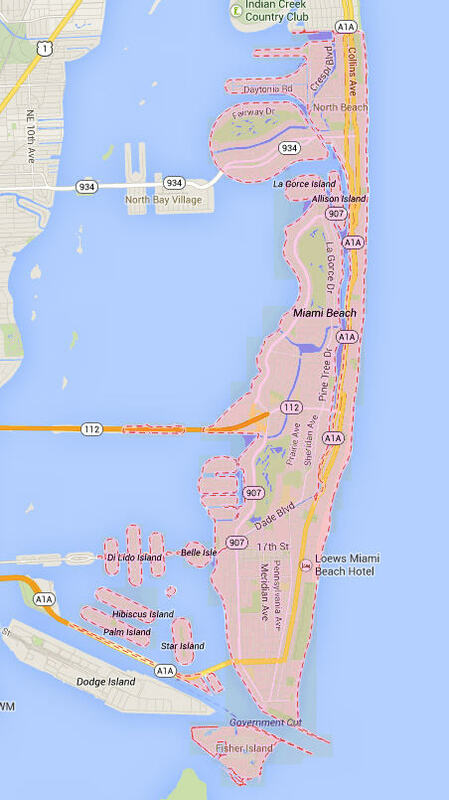 In 1911, Collins and his family formed the Miami Beach Improvement Company and established the term “Miami Beach”. They built the Collins Bridge in 1913, a casino and an oceanfront hotel. The family also began the residential development of the island. The area had a 400% population increase between 1920 and 1925. Today, Collins Avenue and the Collins Canal on Miami Beach are named in his honor. Miami Beach is filled with exciting activities and entertainment for everyone. South Beach, also known as SoBe, is a popular destination for both residents and visitors. Besides the beach, there are many restaurants to dine, shops, and boutique and luxury hotels to stay. Ocean Drive is the center of the Miami Art Deco District, with about 800 preserved buildings. The road begins at South Pointe to 15th Street. The famous Versace mansion is located on Ocean Drive and is one of the most photographed houses in North America. Lincoln Road is a pedestrian road between 16th Street and 17th Street, running east-west with shops, restaurants, galleries, a theatre, and the New World Center concert hall. The history of Lincoln Road began around 1912, when Carl Fisher, an American entrepreneur, cleared the land that was covered by a forest of mangroves. Lincoln Road was the town’s social center and it was also where Fisher maintained a real estate office. Over a period of time, Lincoln Road featured the finest retail destinations, such as Saks Fifth Avenue and Cadillac car dealership. Miami Beach also offers city tours, food tours, sunset cruises, concerts, museums, and much more. Some of the parks located at Miami Beach include Fairway Park, Flamingo Park and Pool, North Shore Park Youth Center, and Normandy Isle Park and Pool. Fairway Park has tennis and basketball courts, a rock wall for rock climbing, a teen club, activities, classes and other clubs. Flamingo Park and Pool is known for its swimming lessons and water playground. There are also currently six dog parks, known as Bark Parks, and one Dog Beach within the City of Miami Beach. Some of the Miami Beach schools include South Pointe Elementary, North Beach Elementary, Fienberg Fisher K-8 Center, Biscayne Elementary, Nautilus Middle School, and Miami Beach Senior High School. South Pointe Elementary and Feinberg-Fisher are an International Baccalaureate World School. Miami Beach Senior High School is an A-rated School with academies focusing on different areas that offer the knowledge and skills for a successful career, such as hospitality and tourism, information technology, marine and environmental science, and visual and performing arts. The City of Miami Beach attracts visitors from around the world because of its assortment of amenities as well as its trend-setting arts and entertainment destination. The area is tourist-friendly and a hot vacation spot for all that it has to offer. From the shops and beaches, to the clubs and restaurants, Miami Beach has something for everyone. If you have any interest living in Miami Beach, contact us and we will assist you with your real estate needs.